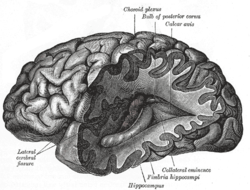 This article is about the natural physiological process in the nervous system. For the therapeutic electromagnetic or chemical stimulation of nerve cells, see Neuromodulation (medicine). Neuromodulation is the physiological process by which a given neuron uses one or more chemicals to regulate diverse populations of neurons. This is in contrast to classical synaptic transmission, in which one presynaptic neuron directly influences a single postsynaptic partner. Neuromodulators secreted by a small group of neurons diffuse through large areas of the nervous system, affecting multiple neurons. Major neuromodulators in the central nervous system include dopamine, serotonin, acetylcholine, histamine, and norepinephrine. Neuromodulation can be conceptualized as a neurotransmitter that is not reabsorbed by the pre-synaptic neuron or broken down into a metabolite. Such neuromodulators end up spending a significant amount of time in the cerebrospinal fluid (CSF), influencing (or "modulating") the activity of several other neurons in the brain. For this reason, some neurotransmitters are also considered to be neuromodulators, such as serotonin and acetylcholine. Neuromodulation is often contrasted with classical fast synaptic transmission. In both cases the transmitter acts on local postsynaptic receptors, but in neuromodulation, the receptors are typically G-protein coupled receptors while in classical chemical neurotransmission, they are ligand-gated ion channels. Neurotransmission that involves metabotropic receptors (like G-protein linked receptors) often also involves voltage-gated ion channels, and is relatively slow. Conversely, neurotransmission that involves exclusively ligand-gated ion channels is much faster. A related distinction is also sometimes drawn between modulator and driver synaptic inputs to a neuron, but here the emphasis is on modulating ongoing neuronal spiking versus causing that spiking. Neuromodulators may alter the output of a physiological system by acting on the associated inputs (for instance, central pattern generators). However, modeling work suggests that this alone is insufficient, because the neuromuscular transformation from neural input to muscular output may be tuned for particular ranges of input. Stern et al. (2007) suggest that neuromodulators must act not only on the input system but must change the transformation itself to produce the proper contractions of muscles as output. Neurotransmitter systems are systems of neurons in the brain expressing certain types of neurotransmitters, and thus form distinct systems. Activation of the system causes effects in large volumes of the brain, called volume transmission. Volume transmission is the diffusion of neurotransmitters through the brain extracellular fluid released at points that may be remote from the target cells with the resulting activation of extrasynaptic receptors, and with a longer time course than for transmission at a single synapse. The major neurotransmitter systems are the noradrenaline (norepinephrine) system, the dopamine system, the serotonin system and the cholinergic system. Drugs targeting the neurotransmitter of such systems affects the whole system, and explains the mode of action of many drugs. Most other neurotransmitters, on the other hand, e.g. glutamate, GABA and glycine, are used very generally throughout the central nervous system. Increase (introversion), mood, satiety, body temperature and sleep, while decreasing nociception. The noradrenaline system consists of just 1500 neurons on each side of the brain, primarily in the locus coeruleus. This is diminutive compared to the more than 100 billion neurons in the brain. As with dopaminergic neurons in the substantia nigra, neurons in the locus caeruleus tend to be melanin-pigmented. In spite of their small number, when activated, the system plays major roles in the brain, as seen in table above. Noradrenaline is released from the neurons, and acts on adrenergic receptors. The dopamine or dopaminergic system consists of several pathways, originating from the ventral tegmentum or substantia nigra as examples. It acts on dopamine receptors. Parkinson's disease is at least in part related to dropping out of dopaminergic cells in deep-brain nuclei, primarily the melanin-pigmented neurons in the substantia nigra but secondarily the noradrenergic neurons of the locus coeruleus. Treatments potentiating the effect of dopamine precursors have been proposed and effected, with moderate success. The serotonin created by the brain comprises around 10% of total body serotonin. The majority (80-90%) is found in the gastrointestinal (GI) tract. It travels around the brain along the medial forebrain bundle and acts on serotonin receptors. In the peripheral nervous system (such as in the gut wall) serotonin regulates vascular tone. Selective serotonin reuptake inhibitors (SSRIs) such as Prozac (fluoxetine) are widely used antidepressants that specifically block the reuptake of serotonin with less effect on other transmitters. Tricyclic antidepressants also block reuptake of biogenic amines from the synapse, but may primarily effect serotonin or norepinephrine or both. They typically take 4 to 6 weeks to alleviate any symptoms of depression. They are considered to have immediate and long-term effects. Monoamine oxidase inhibitors allow reuptake of biogenic amine neurotransmitters from the synapse, but inhibit an enzyme which normally destroys (metabolizes) some of the transmitters after their reuptake. More of the neurotransmitters (especially serotonin, noradrenaline and dopamine) are available for release into synapses. MOAIs take several weeks to alleviate the symptoms of depression. Although changes in neurochemistry are found immediately after taking these antidepressants, symptoms may not begin to improve until several weeks after administration. Increased transmitter levels in the synapse alone does not relieve the depression or anxiety. Gamma-aminobutyric acid (GABA) has an inhibitory effect on brain and spinal cord activity. Opioid peptides - a large family of endogenous neuropeptides that are widely distributed throughout the central and peripheral nervous system. Opiate drugs such as heroin and morphine act at the receptors of these neurotransmitters. Neuromodulation also refers to an emerging class of medical therapies that target the nervous system for restoration of function (such as in cochlear implants), relief of pain, or control of symptoms, such as tremor seen in movement disorders like Parkinson's disease. The therapies consist primarily of targeted electrical stimulation, or infusion of medications into the cerebrospinal fluid using intrathecal drug delivery, such as baclofen for spasticity. Electrical stimulation devices include deep brain stimulation systems (DBS), colloquially referred to as "brain pacemakers", spinal cord stimulators (SCS) and vagus nerve stimulators (VNS), which are implanted using minimally invasive procedures, or transcutaneous electrical nerve stimulation devices, which are fully external, among others. 1 2 Stern, E; Fort TJ; Millier MW; Peskin CS; Brezina V (2007). "Decoding modulation of the neuromuscular transform". Neurocomputing. 70 (6954): 1753–1758. doi:10.1016/j.neucom.2006.10.117. PMC 2745187 . PMID 19763188. Retrieved 2007-04-07. ↑ Castaneda-Hernandez, Gilberto C.; Bach-y-Rita, Paul (2003). "Volume Transmission and Pain Perception". The Scientific World JOURNAL. 3: 677–683. doi:10.1100/tsw.2003.53. 1 2 3 Unless else specified in boxes, then ref is: Rang, H. P. (2003). Pharmacology. Edinburgh: Churchill Livingstone. pp. 474 for noradrenaline system, page 476 for dopamine system, page 480 for serotonin system and page 483 for cholinergic system. ISBN 0-443-07145-4. 1 2 3 4 5 6 7 Woolf NJ, Butcher LL (1989). "Cholinergic systems in the rat brain: IV. Descending projections of the pontomesencephalic tegmentum". Brain Res Bull. 23 (6): 519–40. doi:10.1016/0361-9230(89)90197-4. PMID 2611694. 1 2 3 4 Woolf NJ, Butcher LL (1986). "Cholinergic systems in the rat brain: III. Projections from the pontomesencephalic tegmentum to the thalamus, tectum, basal ganglia, and basal forebrain". Brain Res Bull. 16 (5): 603–37. doi:10.1016/0361-9230(86)90134-6. PMID 3742247. ↑ McIntosh, James. "What is serotonin? What does serotonin do?". Medical News Today. Medical News Today. Retrieved 2015-04-12. 1 2 3 4 5 6 Kandel, Eric R (1991). Principles of Neural Science. East Norwalk, Connecticut: Appleton & Lang. pp. 872–873. ISBN 0838580343. ↑ "Depression Medication: Antidepressants, SSRIs, Antidepressants, SNRIs, Antidepressants, TCAs, Antidepressants, MAO Inhibitors, Augmenting Agents, Serotonin-Dopamine Activity Modulators, Antidepressants, Other, Stimulants, Thyroid Products, Neurology & Psychiatry, Herbals". emedicine.medscape.com. Retrieved 2016-11-07. ↑ "Drug Treatment of Depression". Merck Manuals Professional Edition. Retrieved 2016-11-07. ↑ Bender, KJ; Walker, SE (8 October 2012). "Irreversible Monoamine Oxidase Inhibitors Revisited". Psychiatric Times. Retrieved 7 November 2016. 1 2 Wimbiscus, Molly; Kostenko, Olga; Malone, Donald (2010-12-01). "MAO inhibitors: risks, benefits, and lore". Cleveland Clinic Journal of Medicine. 77 (12): 859–882. doi:10.3949/ccjm.77a.09103. ISSN 1939-2869. PMID 21147941. ↑ Froehlich, J. C. (1997-01-01). "Opioid peptides" (PDF). Alcohol Health and Research World. 21 (2): 132–136. ISSN 0090-838X. PMID 15704349. ↑ Krames, Elliot S.; Peckham, P. Hunter; Rezai, Ali R., eds. (2009). Neuromodulation, Vol. 1-2. Academic Press. pp. 1–1200. ISBN 9780123742483. Retrieved September 6, 2012.